Have you tried watercolor-glue resist paintings with the kids? This style of art is soooo addicting! To change it up, add black paint to your glue. 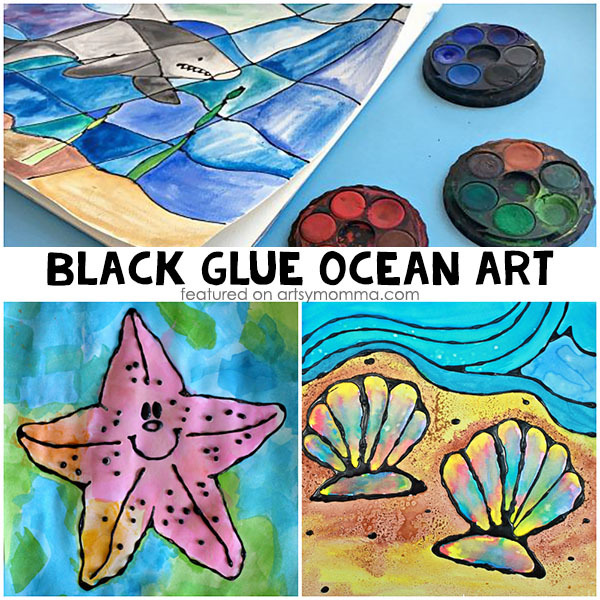 A group of crafty bloggers all shared their ocean themed black glue crafts today and they are amazing! So vibrant and colorful with most including free templates for you to print at home. 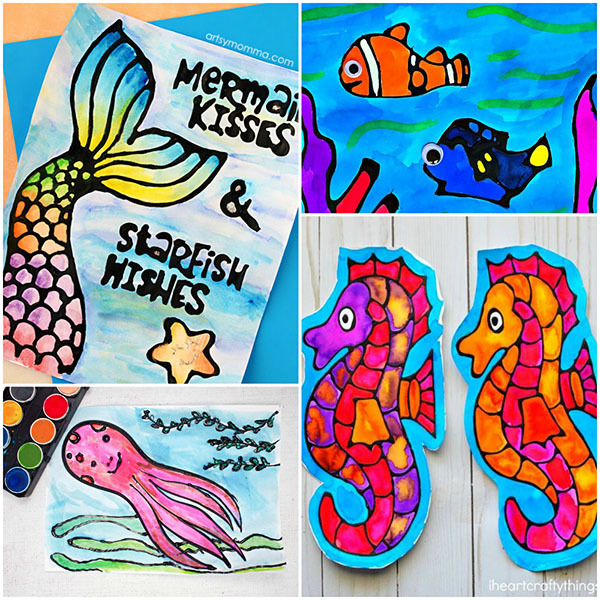 In this post, you’ll find the following under the sea watercolor art projects that use black glue for outlining: rainbow fish, seahorse, jellyfish, starfish, mermaid, octopus, turtle, shark, seashell, narwhal, and snail as well as Nemo and Dory-inspired. If your child is obsessed with mermaids, then they will love our printable mermaid posters! There are 3 different sayings which can be seen in the rainbow mermaid pictured above and the pastel mermaid tails pictured below. Sunshine Whispers made Nemo and Dory-inspired black glue art and it turned out awesome! The Mad House made cheerful octopus using black glue and includes free templates – 1 of the swimming octopus and 1 of an octopus that’s just hanging out. This seahorse watercolor craft is so vibrant and colorful and AMAZING! I love how I Heart Crafty Things bled her colors together to create the cool look. The Rainbow Fish is a much loved book character. The Best Ideas for Kids made a pretty Rainbow Fish black glue craft to go along with the book. Head over to Easy Peasy and Fun to see how she made this adorable turtle using black glue and watercolors. How gorgeous is this jellyfish watercolor-glue resist art project?! Arty Crafty Kids has a step-by-step tutorial so you can recreate this fun jellyfish craft at home with the kids. 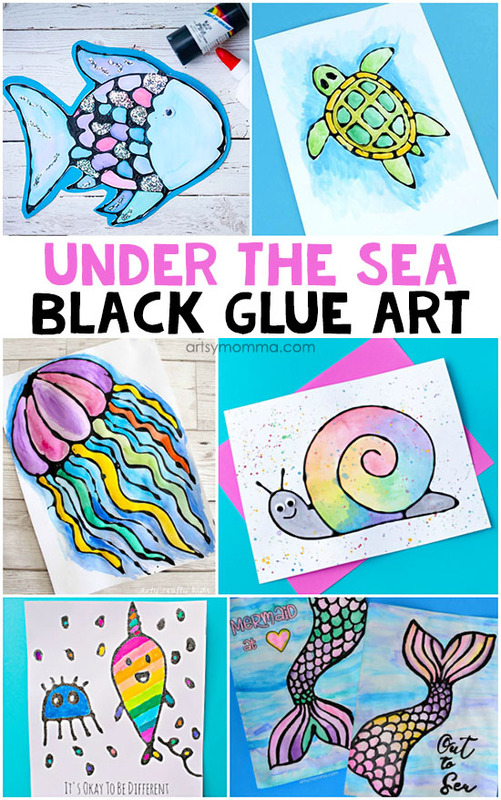 This black glue snail craft is so darn cute! I love how they used paint splatters. Grab the free template over on Fireflies and Mudpies. Another idea inspired by a book is this fun rainbow-colored narwhal craft made by hello, Wonderful. Instead of using regular glue, she used black glitter glue to make it sparkle. Perfect for the ‘It’s Okay To Be Different’ saying she shares along with it! For a simple and fun black glue craft idea, head over to Rhythms of Play to get her starfish template. Kids can customize the face and details themselves too! Add texture to your beach themed seashell watercolor art with this fun tip shared by The Pinterested Parent. The black glue lines are perfect for having a stained glass look like this black glue shark craft. See how Red Ted Art used this technique to create ocean bookmarks too! You can also find a video tutorial for how she made her black glue mix. *This post contains affilaite links. Please read our full disclosure here. We hope you’ll give this fun black glue water color resist art a try! Before you go, we would love to show you this fun round up of ocean crafts to make with the kids of all ages this summer.